Dr. Sandra R. Hernández is a public health pioneer who is committed to breaking down barriers in her quest to support the poor and uninsured. Dr. Sandra R. Hernández became president and CEO of the California HealthCare Foundation in January 2014. CHCF is an independent foundation with assets of more than $700 million, headquartered in Oakland, California, and dedicated to improving the health of the people of California. Prior to joining CHCF, Hernández was CEO of The San Francisco Foundation, which she led for 16 years. 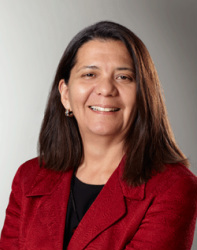 Hernández was the first Hispanic and woman to serve as chief executive officer of The San Francisco Foundation, which is dedicated to improving access and quality health care for the underserved and is one of the 10 largest nonprofits in the U.S. She also served as the first Hispanic and woman public health director for the city and county of San Francisco. She is an assistant clinical professor at UCSF School of Medicine and maintains a practice in San Francisco General Hospital’s AIDS clinic. Hernández is a graduate of Yale University, Tufts School of Medicine, and the John F. Kennedy School of Government at Harvard University. She currently serves on the boards of the Council on Foundations, Lucile Packard Children’s Hospital, Corporation for Supportive Housing, and the National Alliance for Hispanic Health. She is also a trustee of the Western Asbestos Settlement Trust and a member of the Institute of Medicine’s Committee on Implementation of Antiviral Medication Strategies for an Influenza Pandemic.